Create a visual barrier and wind block around outdoor spaces with a cedar hedge. Evergreens, like cedar, make some of the best hedges because they keep their leaves all year for nonstop color and privacy. Proper spacing between cedar trees and position in the landscape is important to grow a healthy, filled-in cedar hedge. Cedar trees keep their needles all year creating continuous visual and wind protection. Placing a cedar hedge well in the landscape goes beyond the visual considerations.Don't plant a cedar hedge too close to the road or sidewalk. Salt, spread on roads and pathways in winter, damages cedar roots and leaves. Plant cedar hedges at a minimum of 3 to 4 feet from roadways and pathways. Moisture loss on steep slopes damages trees. 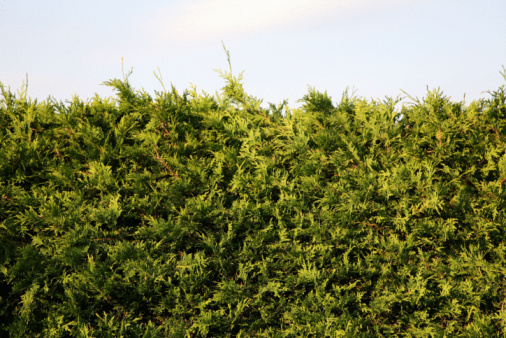 Whenever possible, plant the cedar hedge on flat or slightly sloping grounds. When unavoidable, a layer of mulch helps keep moisture close to the soil and around the roots. Before planting a cedar hedge, pick the right growing conditions. Western red cedar, Thuja plicata, and eastern white cedar, Thuja occidentalis, are commonly used for hedging. Both tree species grow best in full sun or in light shade. In full shade, the trees tend to thin out creating a scraggly look over time. Cedar trees grow best in deep soil with good drainage and a pH range between 6 and 7.5. Run a string between two or more stakes along the line where you intend to plant the cedar hedge. This helps get all the trees in a straight line. Space white cedar trees 12 to 18 inches apart. When planting western red cedar trees and other columnar cedar hedge trees, space the plants 18 to 24 inches apart. Set up the trees along the string line before digging the planting holes or trench. Set the cedar trees aside and dig out the planting site. Bare root trees, shipped without soil around the roots, require a trench 16 inches wide. Make the trench deep enough so that the base of the trunk is level with the natural soil line. Trees purchased in nursery pots, or wrapped in burlap, require a trench two to three times wider than the root ball. Hold the trees upright while backfilling in the trench. Water immediately after planting.